Don't look now, but Han Solo is frozen into your wallet! 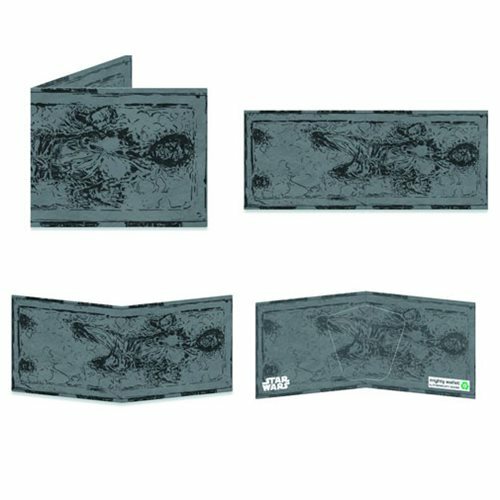 At least this fantastic Star Wars Han Solo in Carbonite Mighty Wallet - Previews Exclusive certainly makes it look that way. If you're a fan of the Star Wars hero, or just want a cool place to carry your cash, you gotta get one of these! This wallet is tear-resistant, water-resistant, expandable and recyclable! Made from Tyvek, this cool wallet resists tearing because of thousands of interlocking plastic fibers spun in random patterns, giving it incredible strength and durability! Ages 13 and up.